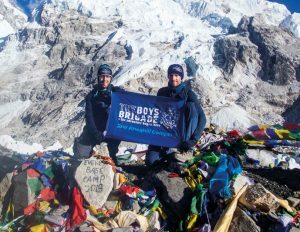 Congratulations to Leaders in 2nd Ahoghill Company who overcame the extreme elements and high altitudes of the Himalayas to reach Everest Base Camp. Leaders Ryan Young and Thomas Clarke were part of a team of nineteen from Northern Ireland who took on the challenge this October in aid of local charity Friends of VisPa. The charity provides practical, financial and spiritual support to VisPa, an education-focused Christian mission in Kisumu, Kenya. Each year VisPa cares for and educates almost 600 impoverished children via their orphanage, nursery, primary school, and secondary school, as well as supporting many young people through university. The team also included 2nd Ahoghill Secretary Geoff Young, and former Leaders Liz Davison, Colin Hayburn, James McBride and David Wylie. All funds raised by the group will support the building of a new primary school at VisPa, and benefit the lives of around 300 children from the area.